Have I mentioned how skilled I am at procrastination? I have some serious, mad procrastination skills. My to-do list is out of control. It makes me shudder just to think about everything I need, should, or want to do. So rather than actually accomplishing something on the list, I just spent a little over an hour making fancy, scrapbook-worthy holiday to-do lists. I didn't even write any tasks on them, I just made pretty pieces of paper to scribble on. Good grief. I'm even procrastinating with my knitting. As you can see, I haven't gotten very far with the striped scarf. It's a tad bit wider than I'd anticipated. It's another of those lazy projects where I just grabbed a needle, some yarn & started casting on stitches. No gauge consideration at all. 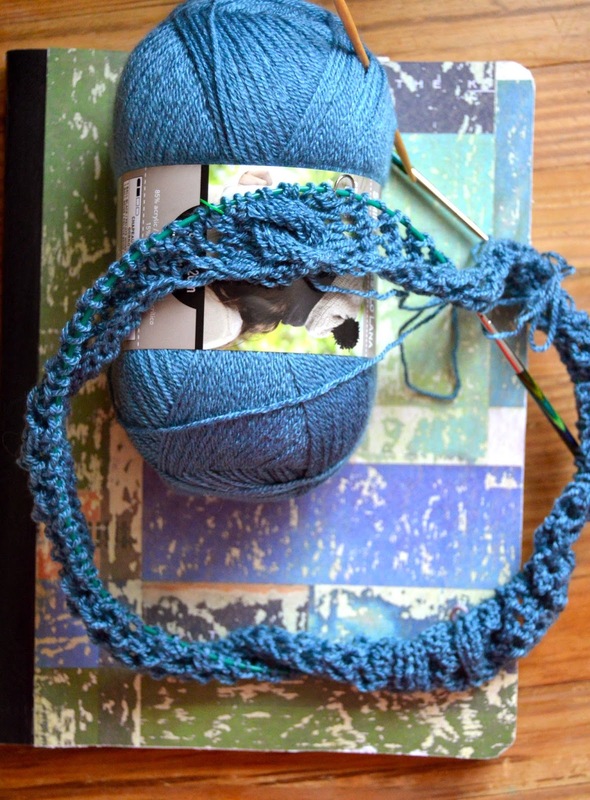 I simply cast on enough stitches that I could knit comfortably in the round with the needle that was closest to hand at the time. And that means, my scarf is turning out to be 17 inches wide. That's not a scarf, it's a sweater body. Good grief. Because progress on the striped scarf/sweater body was creeping along so slowly, I started something else. It's basically a poncho but I hate to call it a poncho because the word makes me think of Red Heart yarn & the 1970's. The funny thing is, I am using acrylic yarn. Cheap acrylic yarn! I guess I really am knitting a poncho! I'd stopped in the local big box craft store for something totally not yarn related but.... this yarn was on sale for less than $2.00 for 678 yard skeins! It's Loops & Threads Woolike in Teal Lake. I stood in the store arguing with myself about it for quite some time. The argument went like, I could knit a lot of lace very cheaply vs. it's acrylic. How will it block? Will it block? vs It's acrylic. It's machine washable. Machine washable lace! Finally, in the end, the fact that it was less than $2.00 won. Who was I kidding? I'd have even put Red Heart in my basket if it was less than $2.00. Anyway, it's going to be a lacy poncho with a cable running up (or down, actually) the front & back. My intention is to wear it like a light weight sweater, not huge gianormous 1970's style poncho. And so far, I'm enjoying knitting with cheap acrylic yarn! The knitted fabric is actually turning out to be very soft & it has good stitch definition. Yay! Ooh - see what it's sitting on? That's my new knitting journal. Which I'm totally in love with. I've kept records of all my knitting projects for years & years but I've never been completely happy with any of the journals I've used. They've been too small, too bulky, too ugly & even too expensive to write in & "mess up." Yes, I have bought expensive, leather bound journals (yes, plural) that I've never written in because I might "mess them up." Good grief! Anyway, this one is perfect. It's a regular old composition notebook (I got 8 of them for about $3.00 at the local wholesale club recently) and I simply glued scrapbook paper on the front & back covers and inside the covers to pretty it up. The finished result is perfect! It's the perfect size, it stays open when laid flat, it's pretty and super cheap so I don't worry about what the inside looks like. I can't wait to cover the rest of them. In fact, it's on my to-do list. Another reason I've been procrastinating with my knitting is that I sorta gave myself a massive case of carpal tunnel. At my job, I get assigned to different areas doing different things. Lately, I've been assigned to one specific area that, in all honesty, only has about two hours worth of work over the eight hours I'm sitting there. The rest of the time, I just sit, literally, waiting for something to happen. During all that waiting time, I get to entertain myself with reading, knitting, playing computer games... 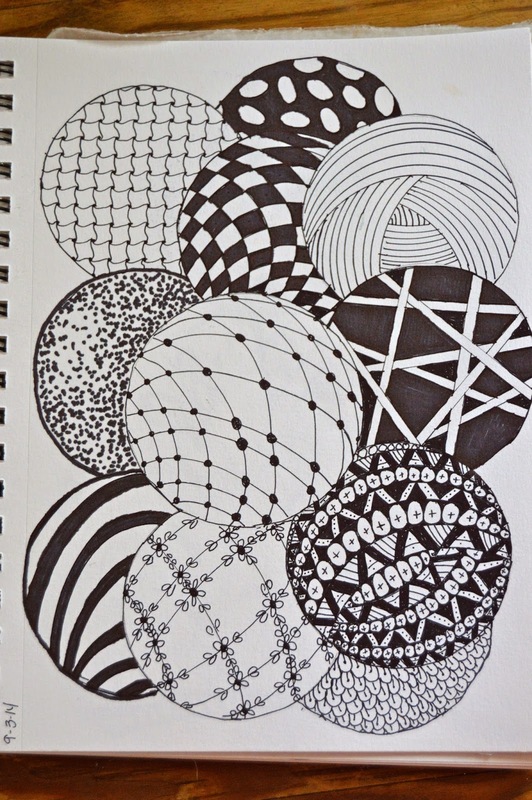 Lately, I've become obsessed with Zentangle. Obviously I'm not an artist, but I really enjoy Zentangling. 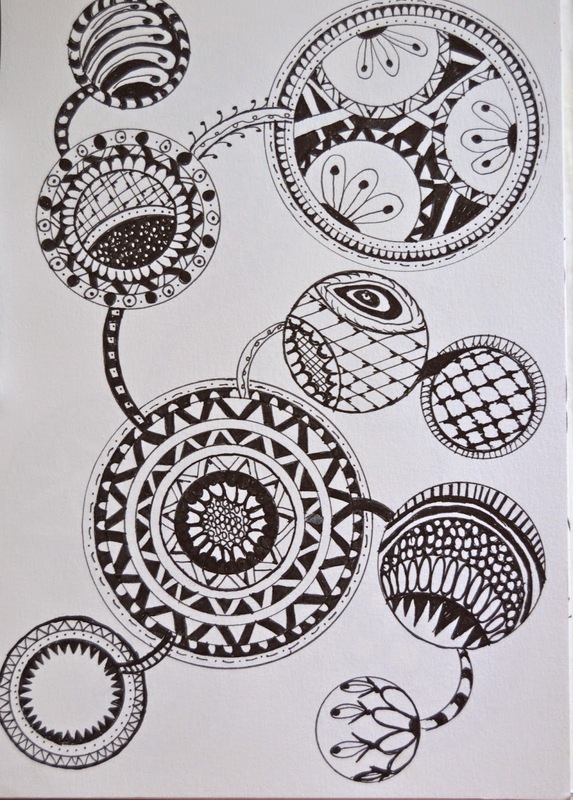 The only thing is, hours & hours of Zentangle doodling is hard on my wrist. It's even starting to affect my elbow. And that is why I haven't been knitting as much lately. 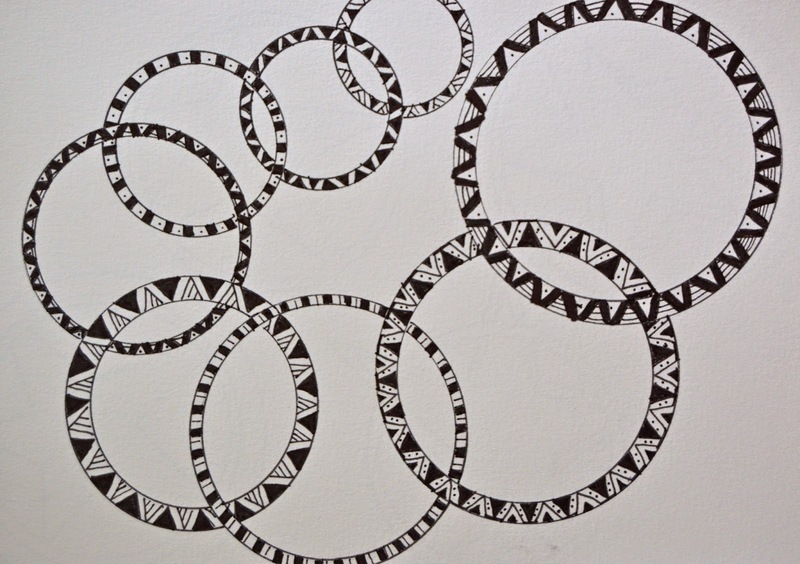 As you can see, I'm slightly obsessed with circles. Like I said, I am not an artist, but Zentangling is a great way to pass the time at work. And on a bright note, it's fall! Yesterday was the first day of autumn. Yesterday morning, our air conditioning was still running but the weather man was promising an overnight low of 48 degrees. By early evening, we turned off the a/c & opened the windows. By midnight, I was chilly & had to get a blanket. Today, I'm sitting here with my warm (more like hot) laptop in my lap & a shawl wrapped around me. I'm even thinking about putting on socks. I LOVE fall!